I’ve written a lot about Evernote, especially about using it with ios devices…so much so that I have an entire section on my website devoted to just that topic. One frustrating aspect of using Evernote on mobile devices historically has been the lack of variety for fonts and colors. A few years back I wrote a guide for working around this…which discusses how to use different colors, sizes and types of fonts. This is still one of my most frequently visited webpages in December 2017! Despite the fact that Evernote 8 now does allow you to use 8 different colors and 3 font sizes in its ios app. That tells me that I’m not alone in my frustration. Evernote 8 was a huge update for Evernote and I think everyone was thrilled to finally have some variety of font colors and sizes. But this seemed in some ways to be a hard fought battle…and many wonder why that’s the case. 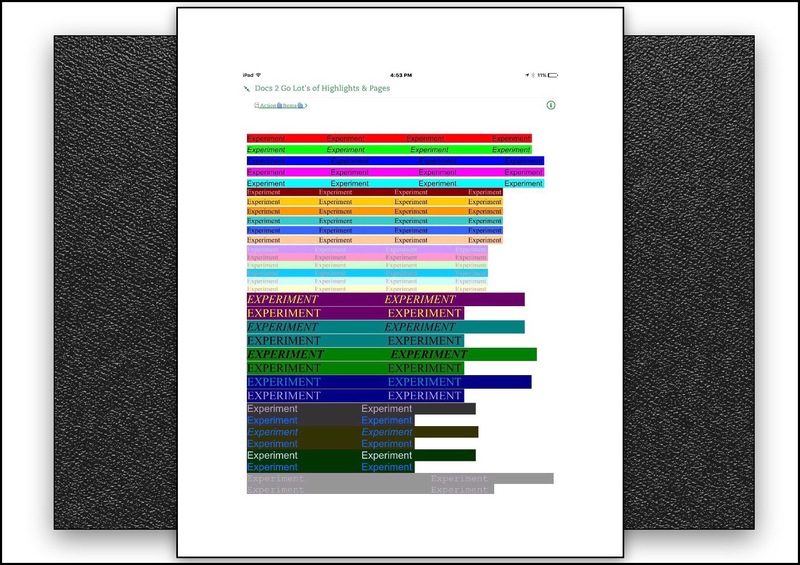 The fact that we were given eight colors defined by Evernote is pointed out as support for the notion that Evernote has a sort of paternalistic relationship with users…in many ways similar to Apple…and the eight colors are their way of giving us some leeway, but not too much! Sadly, this color variety didn’t extend to highlighting colors. Perhaps my strong dependency upon using colors to segregate information so that when I’m referring back to the data at some later date I can quickly gain an overview at a glance without having to take time to delve into a finer detailed reading isn’t something the larger population needs? And by ‘larger population’ I’m including most of Evernote’s design team…specifically those responsible for triaging users’ feature requests. Colored fonts simply did not seem to matter to those working at Evernote…nor did varying font sizes. It seemed to me like they finally added those to be receptive to user’s needs…but it wasn’t a need internal to the company. That observation is important because of how Evernote as a company came into existence and grew. The company was originally a small core group of passionate users which has grown a lot but still maintains that focus on using employees who use their product a lot too. If it was a different makeup of personnel I think that the company would be more amenable to addressing user’s needs above their own. 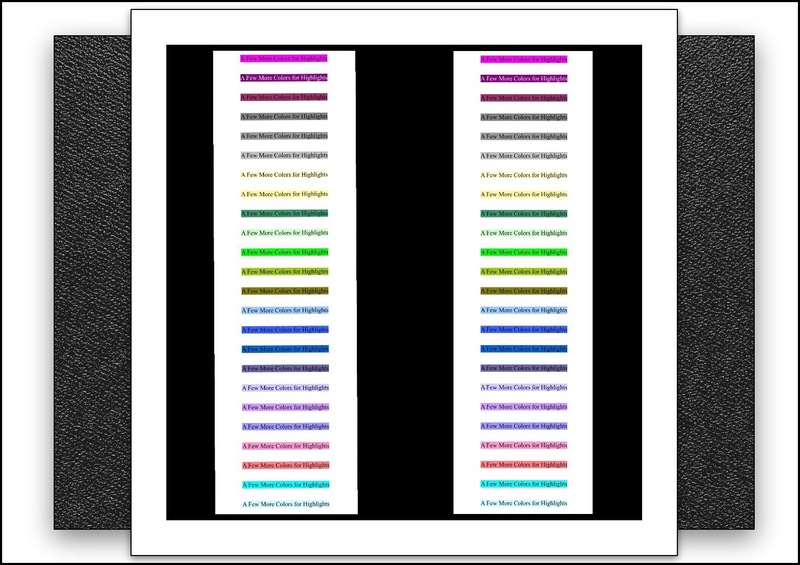 Below is a link to my earlier post in which I describe (in great detail) my methodology and the workaround that allowed me to use various sizes, various colors and even various different font types too. I wrote that post over 2 years ago, and it’s still gets many visitors every single day. Shortly after writing that one I came up with another hack. This one was for using various colored highlighters with EV’s mobile apps. For some unexplained reason Evernote allowed desktop users to have this capability for many years…but not mobile users. While this wasn’t perhaps a purposeful decision, it may or may not have been really…I don’t really know. It was more of an undocumented feature because Evernote’s desktop apps allowed users to format text using their operating system’s built in tools. So this wasn’t an Evernote feature as much as it was a sort of loophole that was never closed until quite recently. I always intended to but never actually did write a follow up piece which described using my same methods to gain access to different colors of highlighters. One reason I guess was because I figured that since the methodology was the same my readers would figure it out after reading my 1st post. What finally prompted me to write this highlighting post was my experience when I decided to create some newer cheat sheets for myself. I discovered that the process wasn’t as easy as it had been earlier. In light of this new development, and because I do use various colors of highlighters too, I decided that I’d once again share my work with everyone. Unfortunately it took me a really long time trying to recreate just how I’d made my original cheat sheets. This is an important aspect, since the way the cheat sheets are formatted dictates how useful they are. In the end I’ve decided that regardless of what worked well in the past that the best format to use for cheat sheets of font & color style libraries is the Microsoft Word format. I’ve been a beta tester for Evernote for years. One thing I’ve noticed about the Evernote organization is that they seem to be organized internally by platform, which may account for the lack of uniformity in features across device types. What do I mean by this? I mean that there’s one group that works on Window 7 applications, another for Windows 8 and yet another for Windows 10. Then there’s a group for Mac OS and another for Windows RT or Mobile ‘Surface’ platforms. The betas for these seem to be within their main groups by platform. But for ios and Android betas there appears to be completely separate groups within the company. So, the Dev & Coding team that works on the public version is different from the 2 teams that are working on the beta ios version or the beta Android one. Oddly, the way the betas are managed is even less consistent. To join the betas for Windows or for Android it’s a fairly simple process…they are open betas that anyone can join. But to join the ios beta one needs to apply and go through a vetting process. And new ios beta testers are only recruited once-in-a-while…usually enmass when that time arises. Why that’s the case is unclear, because the betas seem to fall under the main jurisdiction of one person. But the fragmented organization within the Evernote corporation I think explains why different platforms have led to different feature sets. This makes it tricky if you’re both an ios and an Android user…because Evernote works quite differently for each. The basic concept for how my hack works is this. You create a master list with words displayed in many different variations for whatever you think you’ll need. Each iteration of what you may want to use needs to be included as an example on your cheat sheet because you’ll use each sample like this. You’ll keep a copy of your samples as a separate note within Evernote. Whenever you need to use one of the stylized fonts you saved, you’ll open that note and find the sample you want. Then using copy/paste just copy it from the sample note and paste it into your working note. So, let’s say you want to have 10 different fonts available for use in Evernote. 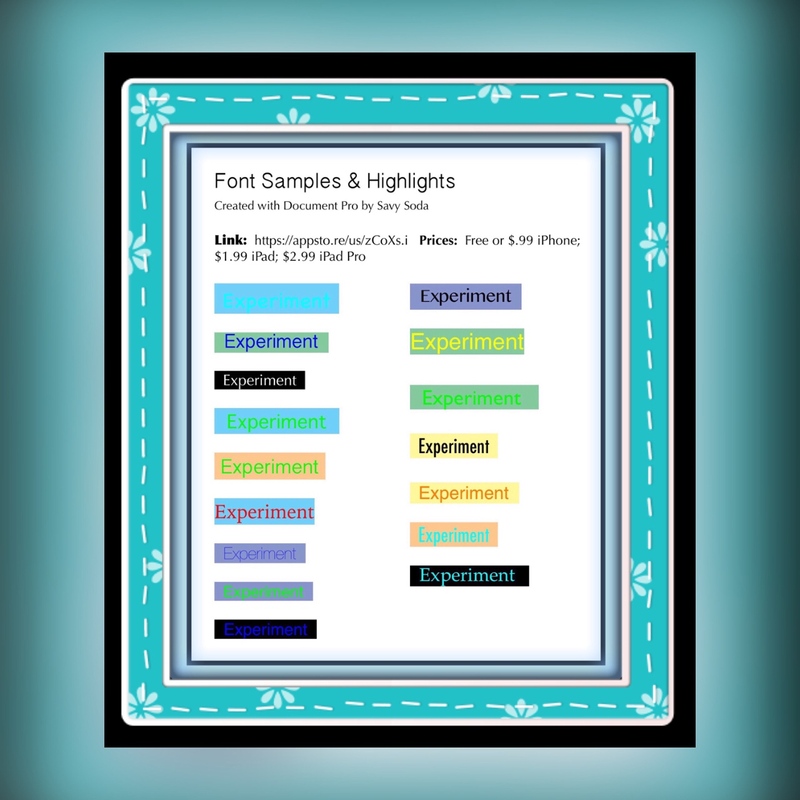 Then you’ll need to include samples for each of those fonts in each different size, each different color and each different highlight color on your master sheet. Basically any style that you may want to use has to be included as a sample on your master cheat sheet. In addition to those variations, I’ve also created masters for various symbols, dividing lines, unique bullet points and other elements that I’ve run across that I like to use too. You can find a link to that download at the bottom of this post. I began with Apple’s Pages app which for quite some time was my favorite ios Word Processing app…sadly, Pages does not offer any variety for colors of highlighters. The only color Pages has available is yellow. I turned to Docs 2 Go, and used that to create my best sample sheet. But, the Docs 2 Go app is overpriced and doesn’t offer a lot of features for that money…so I wanted to come up with a good resource that I could recommend to my readers. In the end it was Microsoft’s Word app that I found would work best for highlights in most circumstances. But there’s one caveat to using the new usually free Word App too, that I discuss below. The reason I’m telling you all this is because I definitely do not have all of the desired combinations of fonts and font sizes along with a comprehensive variety of highlight colors available for my readers right now…despite having spent an inordinate amount of time on this step! One reason is because Microsoft has so many options available in the Word app that the combinations would be endless. Also, it’s quite possible that they might not even function correctly after all my work. So I limited this new master list to just a sampling…and in fact I discovered that they don’t always work as intended. A big part of that is because Evernote is not a static app. Evernote’s developers are constantly working to improve it…as they do so they oftentimes alter the way that different little internal aspects function. It’s really a moving target. This phenomenon is amplified by the fact that as a beta tester, I’m exposed to many more iterations of new versions than the general public is…on average I’d say we get 1-2 new versions every month. So, please keep in mind that what works today may not work tomorrow…but then there’s a good chance that it will work again in the not to distant future! Furthermore, with a few little tweaks you can usually make something work for you right now too. It’s all about recognizing that little variations can make a huge difference. The end result is that in addition to providing my master copies (aka my cheat sheets) I thought I’d take the time to explain how I made mine too. You know, kind of like teaching a man to fish rather than just giving him some! Microsoft’s new Word app is free for all ios users except for people who are using the 12.9″ iPad Pro…that’s the larger iPad Pro. For some unfathomable reason Microsoft has chosen to block those users from using Word for free. They are required to purchase an ongoing subscription to use this ‘free‘ app! The fact that they’ve chosen to do this really annoys me! I think that Microsoft is unhappy with how few people are actually interested in paying a monthly subscription fee to use software that they previously purchased just once…duh! How they could be surprised by this is beyond me…but ostensibly the 12.9″ Pro was developed with Enterprise customers in mind. And Enterprise (commercial) apparently connotes deep pockets…I guess. Whether that actually proves to be the case is yet to be seen. I happen to have the 12,9″ iPad Pro, and I’m not an Enterprise user…I bet that I’m not all that unique either! Below are several master cheat sheets that I created in the last year and a half. The 1st and 2nd ones below I created using Docs 2 Go. 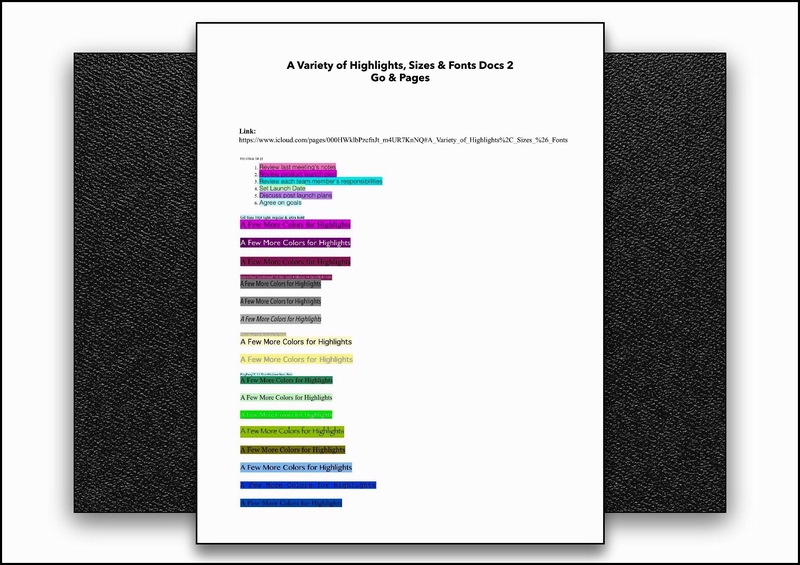 They are the best looking of the group, but they also have the least amount of variety in terms of fonts and sizes because Docs 2 Go doesn’t have very many options for those…but boy do they have lots of options for font colors and highlight colors! In the end because of this variety I created most of my sample sheets using Docs 2 Go in some form. Usually I used the app in the front end to create the variety of colored highlights and then imported the documents into Pages or some other app to change fonts ad font sizes. The 3rd cheat sheet shown below that I created was done using a free app from Savy Soda called Document Pro. Document Pro isn’t a very powerful word processor…it has fewer features than either the Microsoft Word app or the Docs 2 Go apps do…but it’s also completely free. I think there may be a paid version too but I suspect that the feature set is the same and that what you pay for is the removal of advertising. The ads aren’t annoying though, so I give the Savy Soda developers credit for incorporating ads in a manner that doesn’t annoy their users! But I tried to utilize a variety of fonts in this sample. Unfortunately, Document Pro uses the rich text format or rtf for saving documents. When rtf documents are saved in Evernote, they appear to be fine, but when you try to copy and paste any of the highlighted words into a note, the word you copy loses all of it’s formatting including font type, size, color and highlight, so right now at least the cheat sheet below isn’t usable…but I’m keeping it because things change rapidly in Evernote’s world. Because the Document Pro app failed for my purposes I went back to the Docs 2 Go app,and created a few more sample sheets with more colored highlights…in most cases I imported these into pages too to vary the fonts and sizes. You can download and use all of these yourself on any iPads, iPhones and iPod touches that you may use. I haven’t checked it out yet, but these will probably work on Android devices too. Sadly I don’t know anyone with a Window’s or Blackberry phone that I could ask to test these out on…but my guess is that they will work on those platform’s too. If any of my readers happens to know of anyone who does use one of those devices and who might be interested in trying out these cheat sheets, please send them this link and ask them to comment below if they get a chance to let us know if they work for their platform. Make sure prior to downloading these documents that you have Evernote, or at a minimum that you have an app that you can store them in until you get Evernote. Because you will want to store each of these as separate notes within Evernote, so they are readily available to you when you want to use them. 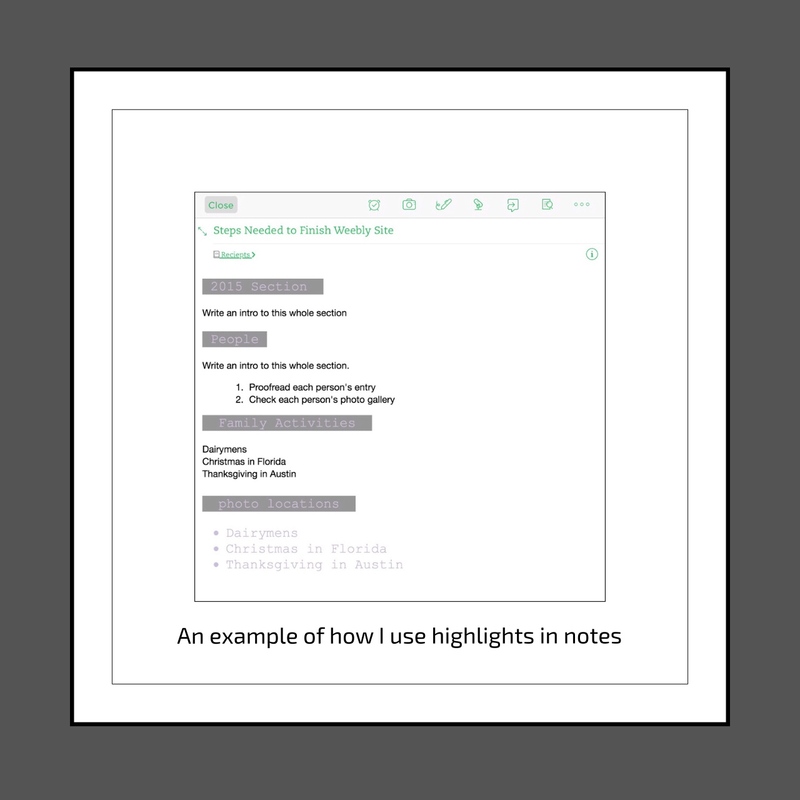 Note that copying and pasting these samples from one app to another…say from Good Reader (my favorite file management app) into Evernote, increases the likelihood that the formatting won’t stick and you’ll lose the highlights completely! The Docs 2 Go app I used for many of my samples is overpriced at $16.99 for the premium version which is the version I have. They dabbled about with different pricing schemes through the years and now it seems they’ve settled upon just 2 options. The Premium and Free versions. I decided to make include a link to the free version here, because I realized that I relied on that app a lot for creating these cheat sheets. I read some reviews for the free version and they are mixed….but for some people they seem to like it so you might be able to create much of what I have with just the free app. I made my first Highlight Cheat Sheets a few years back, but I never shared them because they aren’t very pretty. By this I mean that they are just a conglomeration of a bunch of different fonts, colors and highlight colors without any organization to them…in fact I use the bottom portion of the page as a scratch sheet for testing out various combinations and styles of fonts. I’d always intended on writing this and creating a nice looking, comprehensive sample sheet…but that’s proven much harder to implement than I’d realized. Whatever method I used in the past I’ve forgotten…but I do remember the whole process taking up a lot of time than I’d anticipated it would before I had something that actually worked. This time around when I began working on this I ran into nothing but problems and it turned out that Microsoft Word…the ios app didn’t work for my purpose at all. I won’t bore you with all the sad details, but the gist of it is this. When I export the final product to various sources, sometimes all the actual highlights disappear. If they don’t, they end up being very difficult to work with. Specifically, when I exported them as a .docx files all the highlighted formatting disappeared. When I exported as a PDF the highlights stayed…but when I tried to use the samples via my copy and paste method, something happened…specifically, during the paste operation the highlighting once again disappeared. In order to test this method out, I decided to include some additional useful elements that I use sometimes in Evernote. These include, Symbols, Dividing Lines, Unique Bullets and some symbol art…which is called something else but I can’t think of what that might be right now. So this last link that I’m providing uses the method I just described above. I’ve shared one of my Evernote’s using a public link. I created this note over time by gathering these elements whenever I ran across them. Usually this involved me copying and pasting interesting variations that I ran across online. But ultimately that method changed too when I realized that I could create my own stock elements too, or really just master lists created using a variety of word processors. Here’s a list to the 4 guides I’ve written on using different colored fonts, different sizes of fonts, different font types and different colored highlights for my 2 favorite note apps…Evernote and Apple Notes. They’re listed from most current to oldest. As of January 2017, Evernote 8 gave users the ability to change font sizes and use about 10 different colors right in the ios app. I need to check this but I think it’s probably available in the Android app too. There’s still only one highlight color available however…which is the standard yellow. So if you want to use different highlighter colors you’ll still need to use my workaround method. To see other reader’s comments scroll down past the ads WordPress placed at the bottom and you’ll find a Comment Box & any comments this post has received. Video | This entry was posted in Evernote, Evernote Hacks, Evernote's versatility, Tech Tips and tagged Colored highlight cheat sheets for Evernote, colored highlited box, Evernote Hacks, highlights for Evernote, trick to use colored highlighting in mobile Evernote. Bookmark the permalink. I am very excited to add colors and fonts to evernote. Not being a master in computer things, I want to be sure I understood: I copy your document with the fonts and colors, paste in evernote …and? I’m making a video to demonstrate it to you. I’ll add the link as soon as it’s done. Thanks for visiting! I hope this helps! Let me know and thanks for visiting and your feedback.